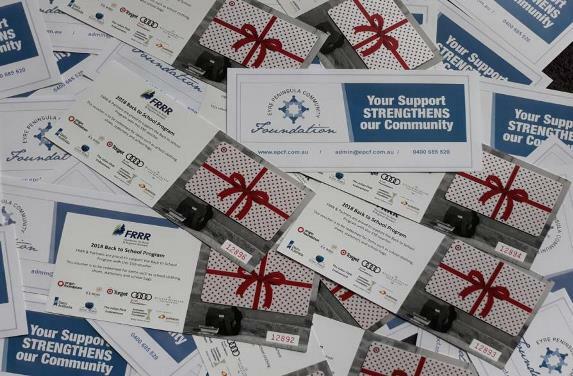 Eyre Peninsula Community Foundation will begin distributing Back to School Vouchers around Eyre Peninsula in late February. The total value for 2019 is $33,700 which includes matched funding. If you would like to contribute to this funding opportunity which is available right now, you can make a tax-deductible donation to the Eyre Peninsula Community Foundation. since 2009. In partnership with the Foundation for Regional and Rural Renewal, the Foundation has distributed over $200,000 to disadvantaged families across the Eyre Peninsula. Each voucher is a Target Card for $50 which enables families in need to purchase items for their school aged children to assist them in starting the new school year. Vouchers are commonly used by families to buy clothing, footwear, school bags, stationery items and other equipment students use at school. The need for this support across Eyre Peninsula is strikingly high. In gathering data to assist Eyre Peninsula Community Foundation to achieve distribution, we found that there is a much greater need for this assistance than the support we could provide. Without the support of school Principals and Governing Councils, this distribution would not be possible. Credit card and bank deposit facilities available.